Jumbo yellow/black/red heart. Also available in sizes 4-5mm, 7-8mm, and 8-10mm. Bright yellow/black/red. Also available in smaller sizes. 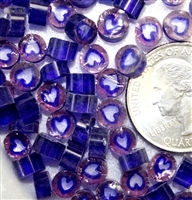 Transparent purple-red/cobalt/clear. Also available in size 6-7mm. White/blue/red. Also available in size 4-5mm. Cobalt/white/black heart. Also available in size 9-10mm. 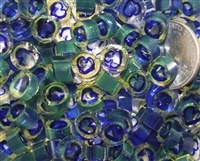 New transparent pattern - Greenish-yellow/cobalt/clear.